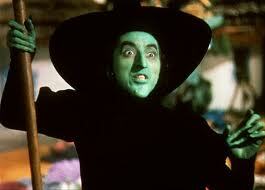 The third book that saved my life was again not a book but this time a film: The Wizard of Oz. A film can act in the same way as a book. In books we escape into a different world where we make up what the characters look like, where their world is and what and who is in that world whilst being guided by the narrator. 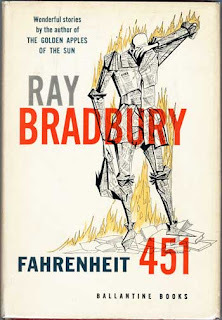 It is being connected to the STORY that allows this engagement (and in some instances learning and change) to take place and this is also the case with a film. This a story in a couple of hours, a journey, and perhaps for a child made more powerful because of the images on the screen: the colour, the music, and the characters. Have you ever wondered why 'The Wizard of Oz', is such a popular film? My mother took me and my brother to see this film, I was about 6 and my brother was 5. For me, this film was one of the most important films I ever saw. Coincindentally I saw it at a time when my understanding of what had happened to me, made no sense. I had only been living with my mother for a few months and to me she was a stranger. Previous to this, I had been placed with a foster mother whom I called Auntie Joan. She had two sons and lived in Burnt Oak. I was placed with her at two and half and I think it was quite an unusual situation. Usually children were placed with a mother and a father. Auntie Joan was recently widowed and I imagine she decided to foster both to help out financially but also to take her mind off her loss. She had two grown up sons and I guess that Social Services thought they would act as a sort of male role model in the absense of a father. Auntie Joan and her two sons, Tony and Frank, were the epitomy of the sixties. Tony had a motorbike with a side car and sometimes he took us to Canvey Island. I seem to remember being squashed in the side-car with Aunty Joan who spent the whole journey petrified and hanging on to me as tightly as possible. I was welcomed into the family and well looked after. I loved them all and was very happy there. Unbeknown to me, my birth mother had been to see Social Services to give her a council house. It was a lot easier in those days, and there were a lot of new developments appearing across London. She was offered a council house in Cricklewood on the understanding that she would have to take me out 'of care'. I remember being taken to see her and screaming the place down before leaving the flat in Burnt Oak. The only way I would quieten down was on the proviso that Auntie Joan would be coming with us. So the Social Worker agreed but of course they didn't explain things properly in those days and no sooner had I been introduced to 'my mother' than Aunty Joan disappeared and I was left with this strange woman and my 'new' brother. 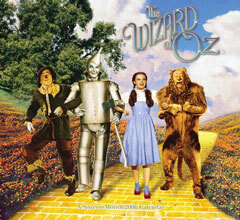 L.Frank Baum first published The Wonderful Wizard of Oz in 1900, and the success of that book led to several sequels. A number of adaptations of Baum's Oz stories for stage and screen appeared before MGM's classic movie was released in 1939. The cyclone in the Wizard of Oz could be symbolic of a chaotic journey into the unconscious. It could also be a metaphor of the upheaval which Dorothy must have experienced when her parents died. Dorothy is lonely in her black and white - dark, surroundings with an aunt and uncle who never smile. Indeed, her only connection to her happy past life is Toto, her dear dog. "It was Toto that made Dorothy laugh, and saved her from growing gray as her other surroundings" (p. 4). There are many explanations of the psychological impact connected with The Wizard of Oz - lonliness, loss (Dorothy has lost her home), emptyness (Scarecrow has an emptyness in his head and needs a brain), (The Tin Man is empty inside and needs a heart) and not forgetting the evil mother represented by the Wicked Witch of the West whom Dorothy must conqueror and thereby release herself from the bad feelings towards the dead mother who abandoned her. 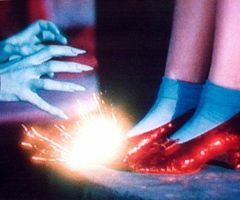 And of course we must not forget the wonderful yellow brick road that is symbolic of a journey, travelling from one place to another (moving on) and of the bright yellow hope that Dorothy radiates at the start of the journey. Whatever its pshychological meaning, children relate to the film and for me it is still as powerful and popular today as it was back then. The physical act of watching the film acted as a way for me to escape the confusing and frightening new place I was in. I joined Dorothy in escaping the grey, world of reality and flew over the rainbow to a beautiful world. But even there all was not as it seemed. Evil witches lurked around corners ready to take Dorothy away from her new friends and stop her reaching her hearts desire, to return home. There's no place like home! Dorothy was told she had the power to get back home all along. And for a while I too believed I could get back home. When I was five years old I used to visit my local library. I spent many happy hours sitting cross-legged on the wooden floor discovering the magical world of books that took me on journeys to make-believe lands. As I grew older I progressed from fairy stories to teenage adventures and then to murder mysteries, romance, horror and literary fiction. 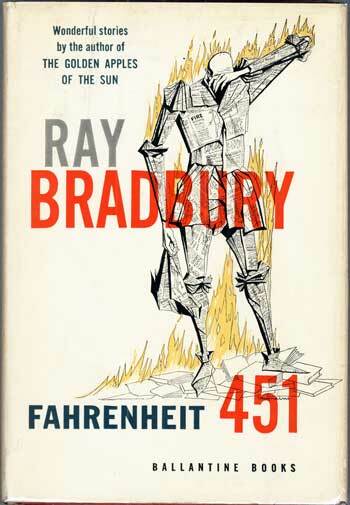 Although I loved Lord of the Rings and the Narnia adventures, for some reason I couldn’t abide Science Fiction. That lasted until I went to university and discovered the intellectual worlds of Arthur C. Clarke and others. What I also remember about my childhood visits to the library were the clandestine experiences of discovering what I thought were secrets on the shelves. Books, I was sure, that had been accidentally left behind and should really have been removed. I loved peeping into the lives of other people whilst at the same time keeping a furtive eye for the Librarian who would surely discover the book I was reading should have been removed or withdrawn. Oh how I sweated at the issue desk! 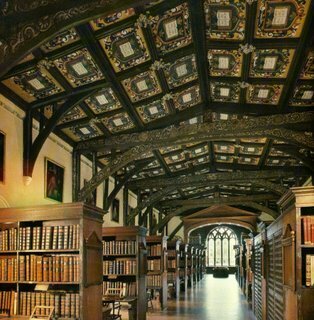 And I never minded the peace of the library, in fact, I hoped library staff would tell those noisy people to be quiet, it was the hallowed space, the wardrobe into other lands, a place to study, to read and to write. Libraries were my escape from a sometimes, harsh world and books my medicine, they made me well. This is not a new fear as far back as 378AD, the historian Ammianus Marcellinus commented, "The libraries are closing forever, like tombs,” and as the Roman Empire fell, libraries seemed doomed to extinction. 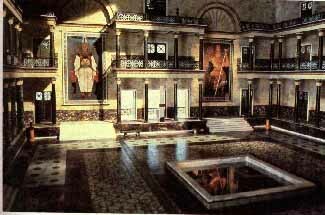 A reconstruction of the The Great Hall of the ancient Library of Alexandria in Egypt. One of the first libraries was the Great Library of Alexandria founded about 300BC. Books were not what we think of today, the library held nearly 750,000 scrolls made mostly from papyrus, but sometimes of leather and kept in pigeonholes with titles written on wooden tags. However this was not a lending library but was a public library open to those with the proper scholarly and literary qualifications. 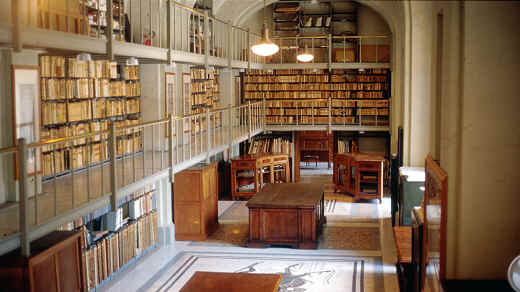 Though the public library first appeared by the 4th century BC, the private library was more prevalent. Aristotle, for instance, amassed a large private collection. He was the first to have put together a collection of books and to have taught the kings in Egypt how to arrange a library. It was, Demetrius, Aristotle’s disciple, who suggested setting up a universal library to hold copies of all the books in the world. Thanks to the Great Library, Alexandria assumed its position as the intellectual capital of the world and provided a model for other libraries to follow. 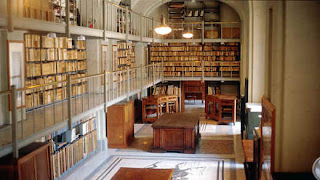 By the middle of 2BC, Rome also boasted rich library resources. Initially comprising some scattered private collections, holdings eventually expanded through the spoils of war. Even Aristotle's famed collection was among the bounty. Julius Caesar dreamed of establishing a public library in Rome, but his vision was cut short by his assassination. After Caesar's death, Asinius Pollio acquired the requisite funds to make the dream a reality. The library was divided into two sections - one for Greek and one for Latin, serving as a model for subsequent Roman libraries. Rome had only three public libraries at the time of Augustus' death in 14AD. But libraries remained the domain of the learned: teachers, scientists, scholars. Where were the masses to go? To the imperial baths, of course! At the baths, men and women, rich and poor could take a bath, meet with friends, play ball - and read a book. Libraries were added to the baths until the 3rd century. In 350AD there were 29 libraries in Rome. In the early 500s in Egypt, Pachomius established a monastery and insisted on literacy among his monks. This was to have a long-lasting effect and throughout the rest of the eastern empire, monastic communities emerged with small and mostly theological libraries. Even though libraries disappeared in the western empire owing to invasion, lack of funds, and lack of interest, monasticism gave rise to an explosion of learning. As Europe emerged from the depths of darkness into the light of learning, its people began to look to the Greek and Roman artistic and literary classics for inspiration. Many aristocrats of the period were dedicated to developing their private libraries. Cosimo de Medici of the famous Florentine family established his own collection, which formed the basis of the Laurentian Library. Also in Italy, the Vatican Library opened in the 1400s. Rome's Vatican Library is one of the richest manuscript depositories in the world, with more than 65,000 manuscripts and more than 900,000 printed volumes. Most works are in either Latin or Greek. Accompanying the growth of universities was the development of university libraries, which, in some cases, were founded on the basis of a personal donation. For example, Humphrey, Duke of Gloucester, donated his large collection to Oxford University in the early 1400s. Gutenberg's movable type innovation in the 1400s revolutionized bookmaking. Printed books replaced handwritten manuscripts and were placed on open shelves. A lot of factors combined to create a "golden age of libraries" between 1600 and 1700: the quantity of books had gone up, as the cost had gone down, there was a renewal in the interest of classical literature and culture, nationalism was encouraging nations to build great libraries, universities were playing a more prominent role in education, and renaissance thinkers and writers were producing great works. Some of the more important libraries include the Bodleian Library at Oxford, the Mazarine Library and the Bibliothèque Sainte-Geneviève in Paris, the National Central Library in Italy, the Prussian State Library, and the M.E. Saltykov-Shchedrin State Public Library of St. Petersburg (founded by Catherine the Great). The earliest public library in the UK was associated with London's Guild Hall in 1425. A second opened in Edinburgh, Scotland in 1580. Neither of these still exists, but one established in 1653 in Manchester, England survives. The beginning of the modern, free, open access libraries really got its start in the U.K. in 1847. Parliament appointed a committee, led by William Ewart, on Public Libraries to consider the necessity of establishing libraries through the nation: In 1849 their report noted the poor condition of library service, it recommended the establishment of free public libraries all over the country, and it led to the Public Libraries Act in 1850, which allowed all cities with populations exceeding 10,000 to levy taxes for the support of public libraries. It was after this that libraries began to spread throughout the nation. Another important act was the 1870 Public School Law, which increased literacy, thereby the demand for libraries, so by 1877, more than 75 cities had established free libraries, and by 1900 the number had reached 300. This finally marks the start of the public library as we know it. Also at this time, Florence Boot, married to Jesse Boot (son of John Boot 1815-1860, who was founder of Boots, the chemists) inspired by her interest in literature and the arts, founded a subscription library, the Boots Booklovers' Library. She also had the idea of opening elegant cafés in the larger stores. These had an impact on sales, attracted the more affluent middle classes to shop at Boots and encouraged loyalty. 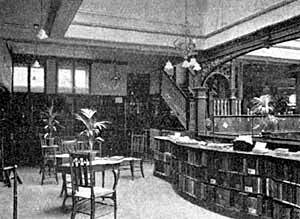 By 1935, the Booklovers' Library was flourishing, with branches in 450 stores supporting over half a million subscribers. Just 30 years later in 1965, it was announced that the Booklovers' Libraries were to close - the last branch shut in 1966. Public libraries exist in most places in the world and are often considered an essential part of having an educated and literate population. Public libraries are distinct from research libraries, school libraries, or other special libraries and are there to serve the public's information needs, as well as offering materials for general entertainment and leisure purposes. Public libraries typically are lending libraries, allowing users to take books and other materials off the premises temporarily; they also have non-circulating reference collections. Public libraries primarily focus on popular materials such as popular fiction and movies, as well as educational and non-fiction materials of interest to the general public; computer and internet access are also often offered. When deciding what changes to make to public libraries, local authorities are legally obliged to abide by the Public Libraries and Museums Act 1964. The legacy of the Act can be followed through subsequent legislation that built on and expanded the powers granted in 1850 and the 4,540 public libraries that exist in the United Kingdom in 2010 can trace their origins back to this Act. This law means that public libraries are a statutory service; councils have a legal duty to provide them. Councils must ensure that the service they provide is “comprehensive and efficient”. They also have a duty to promote the service and to encourage people to use it. The Law also makes it clear that councils cannot charge people for library facilities that make up part of their statutory provision. Philanthropic provision of books was a common Victorian activity. From the mid 19th century there was a rise in secular libraries. In Seymour Terrace, North Finchley, a voluntary library was opened in 1896 called The Finchley Public Library. The stock of books started with around 1,200 volumes, which expanded by March 1897 to over 5,500 volumes. However, by the end of the 19th century, many libraries were finding it difficult to cope with demand and members of the public began to request funding from local authorities. And so local councils began to fund and build public libraries. Within the area that is now the London Borough of Barnet, there were five smaller local councils: Finchley, Friern Barnet and Hendon that were with Middlesex County Council and Barnet and East Barnet that came within Hertfordshire County Council. If we look at the list below, we can see that the 1930s were the ‘boom years’ for public library openings. Many of our libraries in the Borough of Barnet grew from those initial part-time commercial, religious and secular libraries, so although the above list illustrates the ‘public’ opening many of the libraries already had a part-time library service. Fast forward to 2011 and public library users face the same fears as Ammianus Marcellinus back in 378AD – that the libraries are closing forever and once they are gone they will NOT be reinstated. Back in 2004, Totteridge library was closed and sold to property developers for £1.5 million. In response to planned funding cuts and library closures, the East Finchley Library Users’ Group (EFLUG), Barnet Unison and Barnet Alliance for Public Services have held a series of protests earlier this year at East Finchley and East Barnet libraries. Stalls were set up for the public to sign a ‘Save Our Libraries’ petition, which has already been signed by more than 1000 residents. 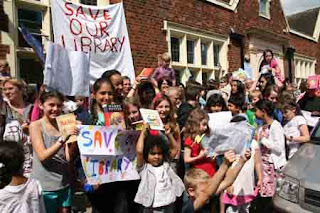 There was also a demonstration outside Friern Barnet Library in May this year, organised by residents opposed to the planned closure. Hampstead Garden Suburb library in Marketplace, which has been in its current location for some 60 years, will close and there are plans to relocate North Finchley (in the artsdepot), Finchley Church End and Graham Park. Barnet Council have announced plans to cut £1.41 million from their library budget over the next three years. According to Barnet’s Strategic Library Review, library services will be provided from the artsdepot to compensate, but residents say the artsdepot is too far for many users to travel. And let’s not forget back in 2004, Mike Freer, the then leader of the council, stated that a replacement library facility was planned for the High Road, Whetstone to replace Totteridge library that was sold for £1.5 million to property developers. This never happened. Was the £1.5 million part of the £27.4 million lost in the Icelandic banks fiasco? And is this real reason why Barnet have made such drastic cuts to our public services? Over 10% of UK libraries are currently under threat – over 500 out of a total UK public library provision of just over 4500. Some councils are suggesting that library services can be run by volunteers. This takes no account of the professional and ethical standards to which professional librarians must adhere, including data protection. On a local level, a number of councils including Gloucestershire and Somerset are facing legal challenges because they appear to be in breach of the Public Libraries and Museums Act, as well as other laws including the Equality Act 2010. If it looks as if a council seeks to make changes to the library service that may be illegal, the Secretary of State for Culture, Media and Sport, Jeremy Hunt, has a duty to intervene. Many people around the country have made requests for him to do so, but as yet, he has not stepped in. As a result, Alan Gibbons, an author and library campaigner who runs the Campaign for the Book, has launched a national legal challenge because he believes that national government have failed in their duty. Voices for the Library (www.voicesforthelibrary.org) are helping to collect information for the case. "What a wonderful experience it was to be in the library basement to dash up and down the stairs reinvigorating myself with the touch and smell of books that I knew and books that I did not know until that moment." As we go to press, more than 5,000 Barnet residents signed petitions against the closures. Their pleas fell on deaf ears. Friern Barnet, North Finchley and Hampstead Garden libraries will close. Totteridge is already closed. There is talk of the community taking over some of the libraries, the council’s idea being that the community should find ways to save the libraries itself. It is not the responsibility of the community to run libraries with untrained volunteers. The Public Libraries and Museums Act 1964 says a local authority which is a library authority must ‘provide a comprehensive and efficient library service for all persons…’ Its stock of ‘books and other printed matter, and pictures, gramophone records, films and other materials’, must be ‘sufficient in number, range and quality to meet the general requirements and any special requirements both of adults and children’. If the local authority has been providing this service ANY reduction is likely to be unlawful and the statutory duties will not be adequately fulfilled. We will end this piece with Kate Salinger, councillor for Coppetts ward, who told the cabinet at the Hendon Town Hall library closures meeting, "…You are going through the motions of democracy – some of you don’t even look like you’re listening." And of course, she was right!